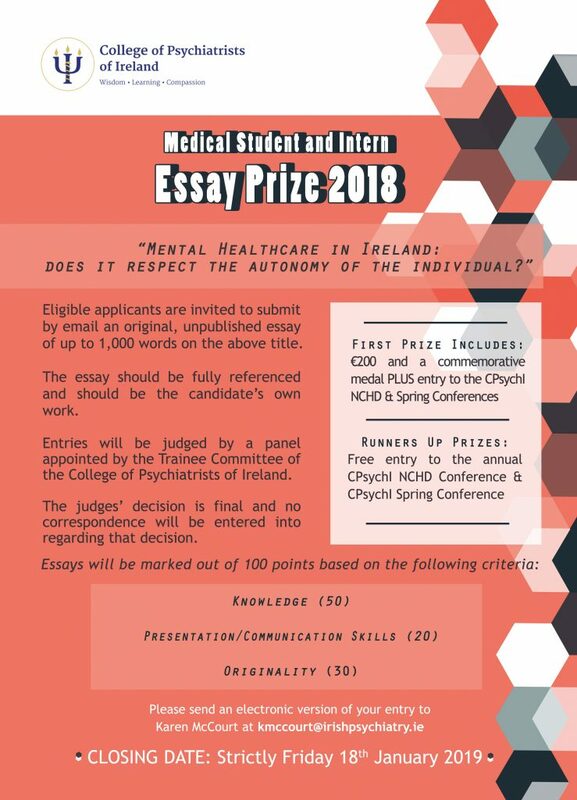 The College of Psychiatrists of Ireland is delighted to announce it’s annual Essay competition which is now open to submissions from current Medical Students as well as those in their Intern Year. Essays should be sent for the attention of Ms Karen McCourt in the Postgraduate Training Department at kmccourt@irishpsychiatry.ie by the above stated deadline. The shortlisted applicants will be invited to attend the NCHD Conference on 1st March 2018 in The Hilton Hotel, Kilmainham, Dublin 8, where the winner will be announced.